MP Julian Huppert has called on the government to set a target for green UK electricity by 2030 to encourage investment from renewable energy companies which could bring new jobs to Cambridge. He wants the Energy Bill to include a clearly defined pathway to carbon-free electricity to deliver green jobs for the city and the East of England generally. 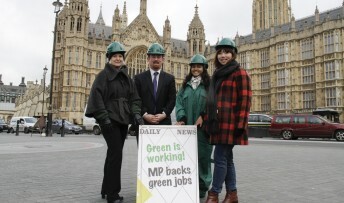 “Our green agenda is bringing huge benefits,” said Julian. “We are insulating homes and developing renewable energy which will create new business opportunities and jobs as well as tackling climate change. Julian’s call came as he joined members of Stop Climate Chaos, a coalition of more than 100 organisations including the RSPB and Friends of the Earth, in Westminster to show support for the green economy during the fourth anniversary of the Climate Change Act. He said the Energy Bill must build on the success of the thriving green economy – which according to the CBI, employs almost a million people and accounted for a third of UK growth last year – and ensure we meet goals for tackling climate change. And today (Tuesday, December 4) Julian will be speaking at a launch of a report on the potential for City Deals to accelerate low carbon growth in cities. If a City Deal can be successfully negotiated with government for the Cambridge area, it will bring more funding and powers straight to the city giving greater opportunity for more local decision making. 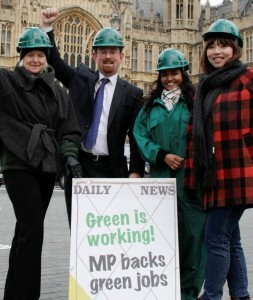 Julian added: “We have so many opportunities to promote the growth of renewable energy for our towns and cities. This, in turn will generate jobs, grow our economy and protect our planet for future generations.